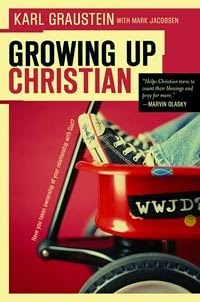 Growing Up Christian: What’s a Church Kid? Here is a section from chapter 1 of my book Growing Up Christian. Once, I spoke at a high school leadership conference where a few of the teenagers didn’t like the term “church kids.” To them it had the same connotations as “pastor’s kids”, a term often synonymous with troublemakers. Maybe you feel the same way, but when you really understand what a church kid is, I think you will see that it’s an overwhelmingly positive term. I’m a church kid myself, and I am incredibly grateful to God for the many blessings we church kids experience while growing up Christian homes. We have been raised and trained by godly parents; we have been repeatedly told the message of the gospel; we have been taught the Word of God from a young age; we have regularly attended church where we have worshiped God and have been taught about his character; we have lots of Christian friends; and we have been protected from many of the negative influences of the world. In July of 1971, God greatly blessed me by allowing me to be born into a strong Christian family in a small town in New Hampshire. My parents did not grow up in Christian homes, but God saved them about six years before I was born. They faithfully raised me according to biblical principles. Our family regularly attended church, prayed together, and had times of family Bible study. My parents sent me to youth group meetings, a Christian school, and a Christian college. I grew up a fairly typical church kid. Just before turning four, in July of 1975, God drew me to himself through the gentle teaching and leading of my parents. At that time I repented of my sins and professed Jesus as my personal Savior. I had a four-year-old’s understanding of the gospel, and in retrospect, I think a genuine conversion. (Isn’t it amazing that the gospel message is simple enough for a four-year-old to grasp!) I do not remember the time prior to my salvation. I practically grew up a Christian. As I grew older, my faith steadily grew too. God used specific trials in elementary and high school to refine my faith and teach me how to trust him. After high school, I left rural New Hampshire and headed to the suburbs of Chicago to attend Wheaton College, where God helped me begin to live out my faith and form a walk of my own. He also confirmed a call on my life to work in Christian education, and since graduating in 1993, I have worked full-time as a Christian school teacher and principal. I am a church kid. I grew up surrounded by church kids, went to college with church kids, and have worked closely with church kids for the past eleven years. I have experienced and observed both the blessings and dangers of growing up in a Christian environment, and I have a strong desire that church kids learn to praise God for the privileges they experience and carefully navigate the dangers they face.